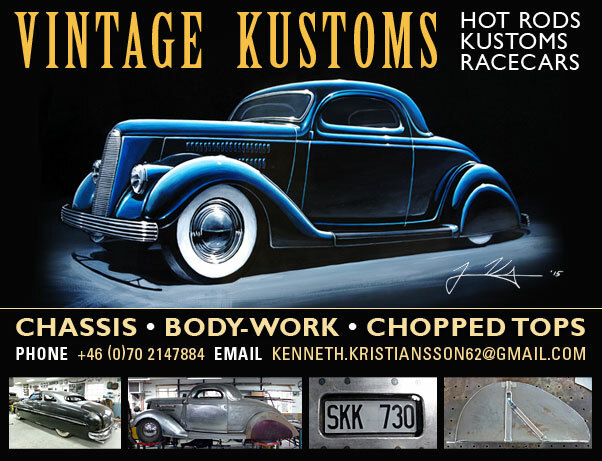 After 11 days of hard work Ronnie and Micke got their Historic Customs on the road and ready to go. 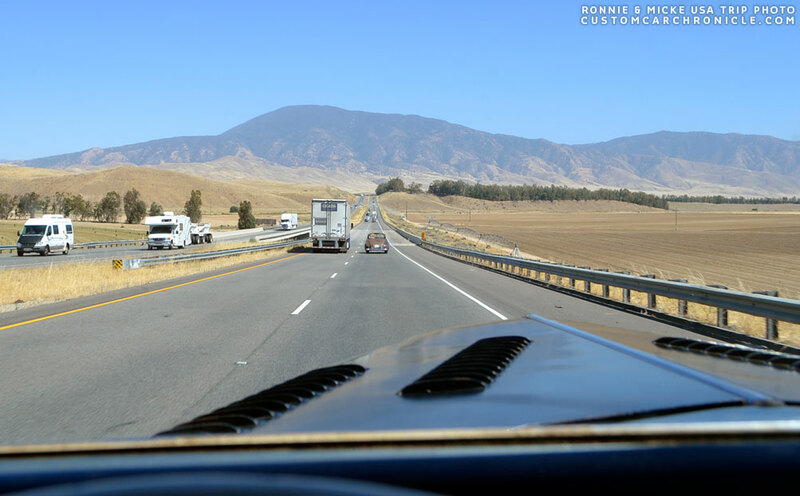 In early July 2016 Ronnie Lindblom and Micke Hedberg left Sweden for their dream road trip in the USA. 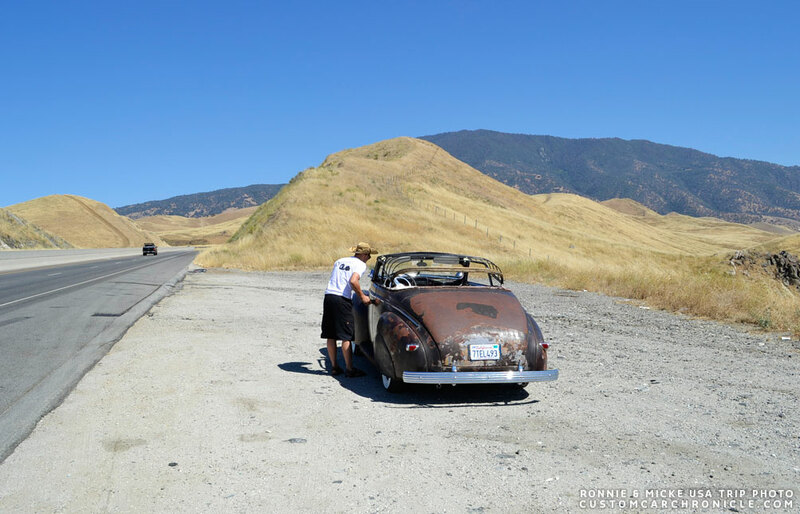 Both guys had bought an historic custom in the month prior to this trip, and along the way the idea had grown to fix up their cars and make a road trip of a life-time. 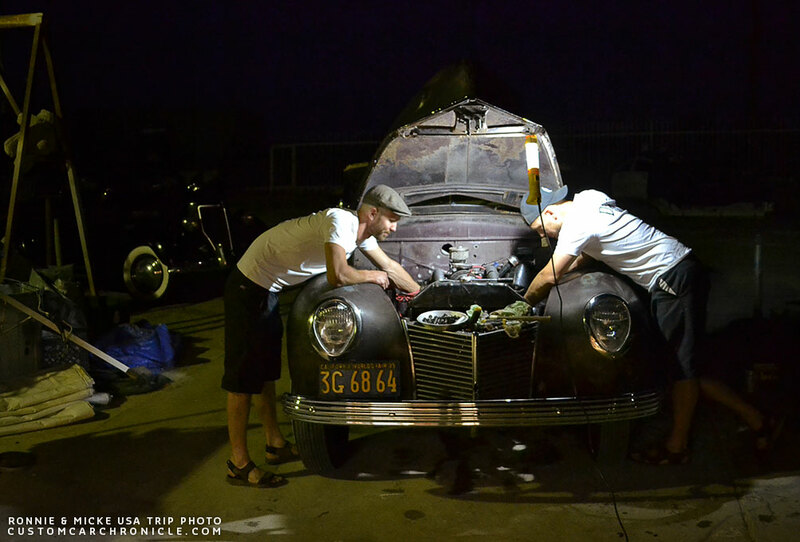 After 11 long days and nights working on their cars, they finally had them ready to hit the road. You can read about the first 11 days of their journey in Part One of this series. Tuesday afternoon and ready to take off from Squeaks place. With the cars now finished, all the tools, supplies and others things needed for the trip was loaded into the trunks of the cars. They said goodbye to everybody who had helped them in Bakersfield and they were ready to hit the road. Yeah! 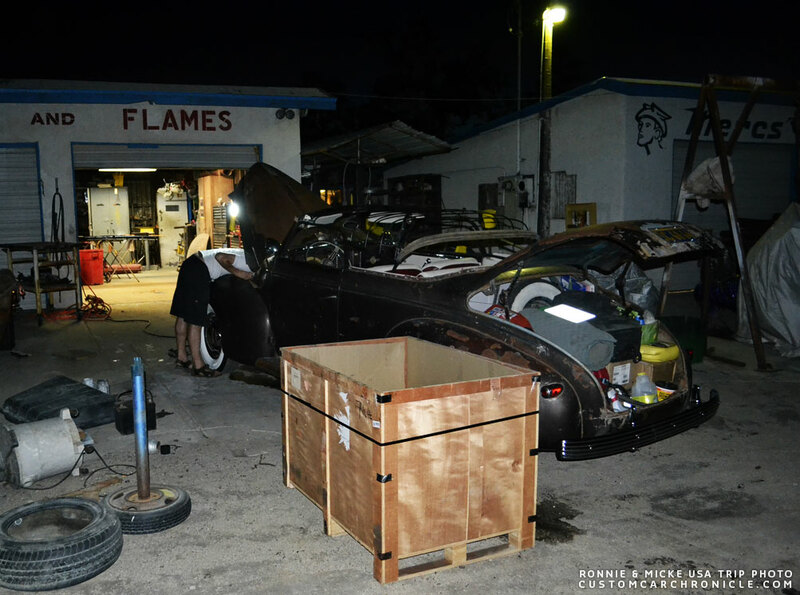 Both cars had their trunks filled to the top with tools, spareparts and water. This made it a little tricky to fill gas! 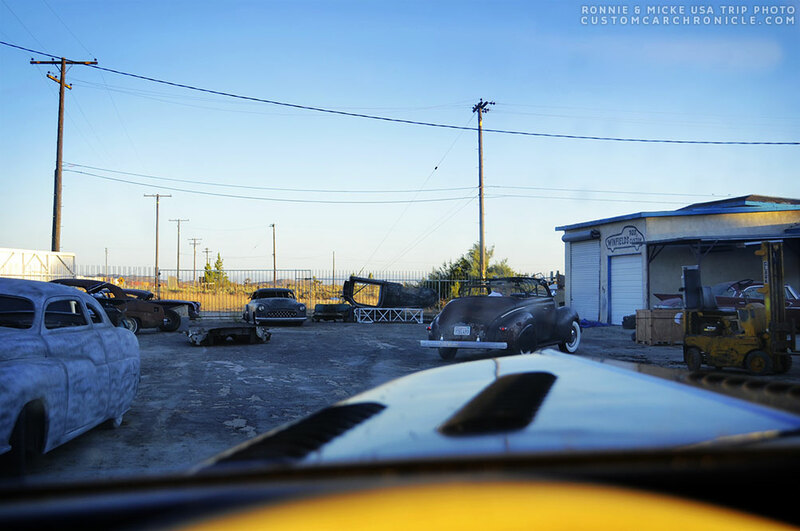 Bakersfield, California. 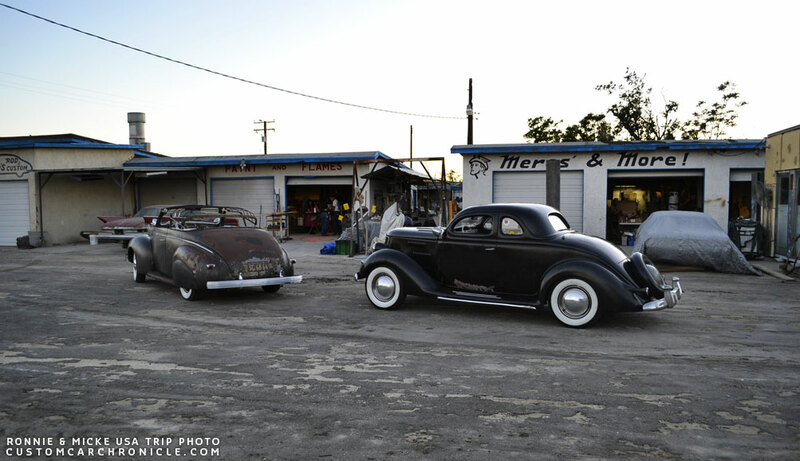 Ronnie is driving his ’39 Merc and snaps a picture of Micke in his ’36 Ford across the street. With the cars on the highway for the first time. Exciting and it feeeels good! 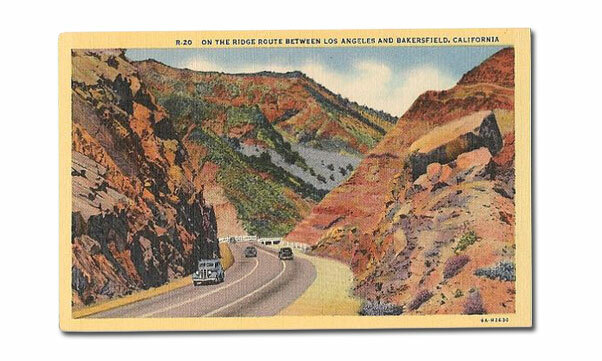 What not the guys had realized was the steep mountain-pass right outside Bakersfield. Afterwards they remember Squeak telling them all about this, but who had time to listen to these “small” details when they were too excited and focused to get the cars ready to drive? It was really going uphill here, and both cars were really struggling. Half an hour from Bakersfield the temp gauges were hitting maximum. Pretty soon Micke´s radiator started to steam and the winshield started to fog when the steam came thru the louvered hood. It was definitly time for the first stop. Both cars was boiling. 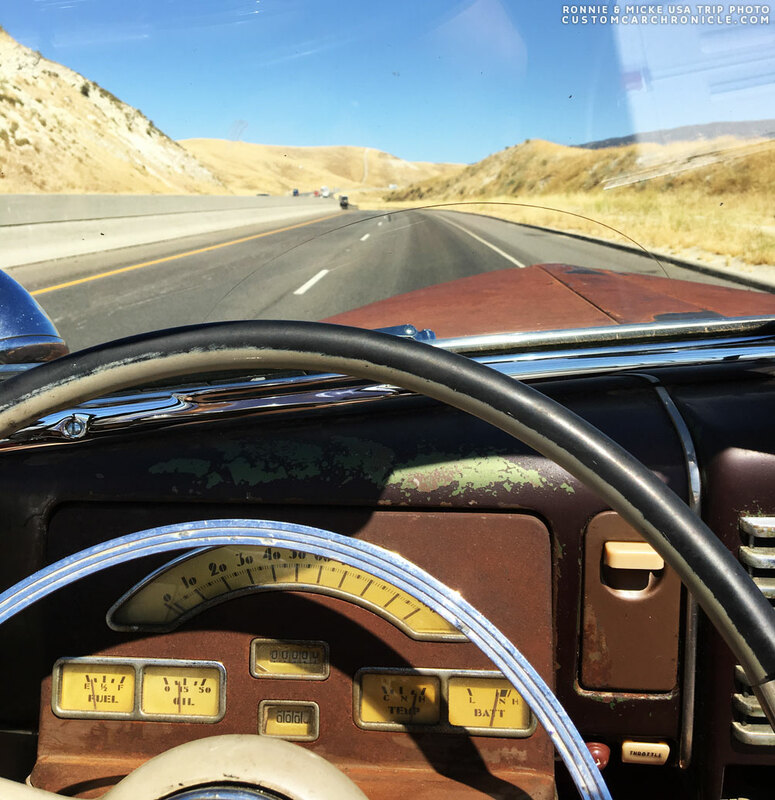 When the cars had cooled down enough they took off, desperately in need of flat roads or even better downhill… But the only way to find a downhill was to look in the rearmirror, so not before long the cars got hot again. While the cars were cooling down again Micke was trying to get some work done on the car, perhaps to solve a bit of the cooling problem. After a while he started the ’36 and it sounded really crappy. At first they thought the floatlevel was wrong as the hill was so steep, but adjusting it did not make the old flatty run any better. After some contemplating they figured out it must be the condenser… mmm could be worse, they had brought an old spare condenser. 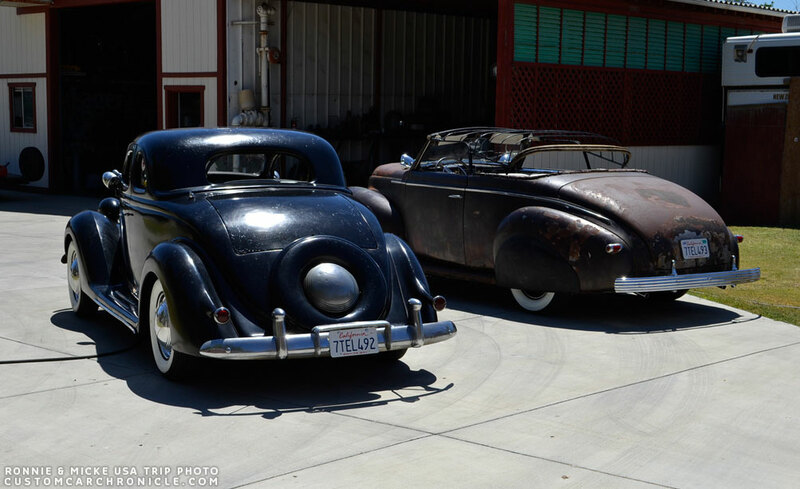 They packed it in the trunk… but which trunk?! and where?? Finally they found the spare condenser and while Micke was installing it he lost a screw in the gravel.. Great! Eventually they found another screw they could use and fix this problem. 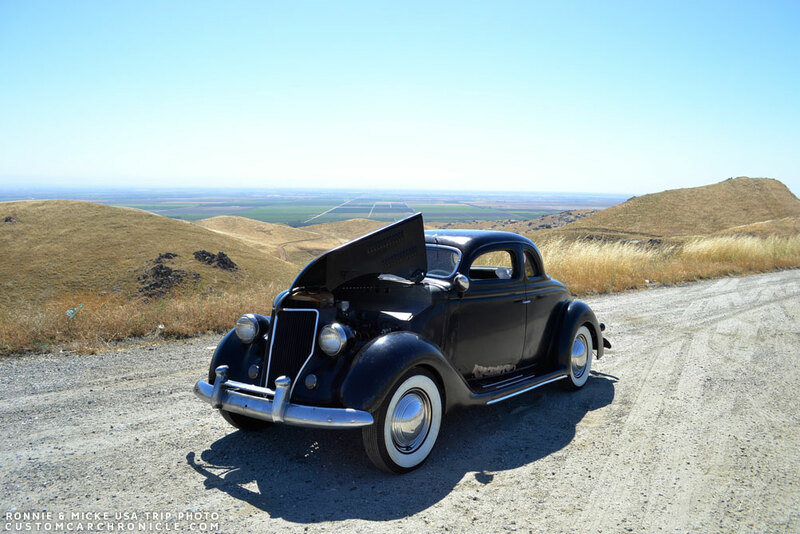 The steep hills and the over 100 degrees temperatures was brutal, and too much for the cars. While working on Micke’s 36 and waiting for both cars to cool down, 3 modern cars also had to stop at the same hill because of overheating. 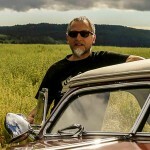 To drive those historical customs on those old roads is an adventure, but to do it without gps and with partly hand-drawn map is something else! It really took them back in the days. Here´s the guys sitting in a crossroad trying to figure out the right way to Mr Winfield. Sometimes you have to drive miles and miles to find a roadsign out there… This was – as they found out later – the wrong way! Even after the guys had left the steep mountain pass behind them the Merc maintain to have overheating problems. After many stops with boiling engine and some minor problem to find the right road it was a real relieve when they finally saw Gene’s huge shop space in the distance. They arrived at Gene Winfields shop shortly before it started to get dark. Gene knew the guys were coming as Squeak had called him 5 hours earlier and told him they had just left Bakersfield. So he was getting a bit worried about the guys. Gene’s place… they finally made it. The gate was open and they drove right up to the shop area. Excited to meet Gene, and also knowing they could hopefully figure out the engine problems and solve it for the remainder of the trip. 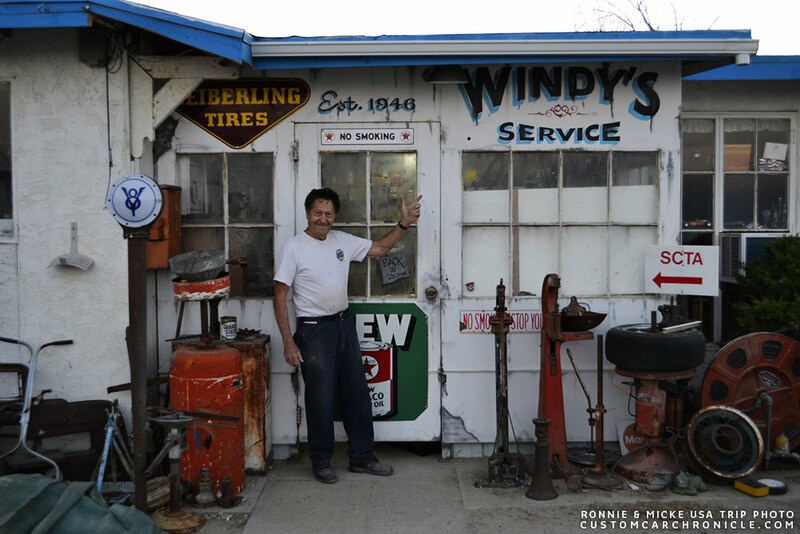 It was a long hot day… finally parked at goal number one… Gene Winfield’s shop. “Where the hell have you been guy´s“, was Gene first response. 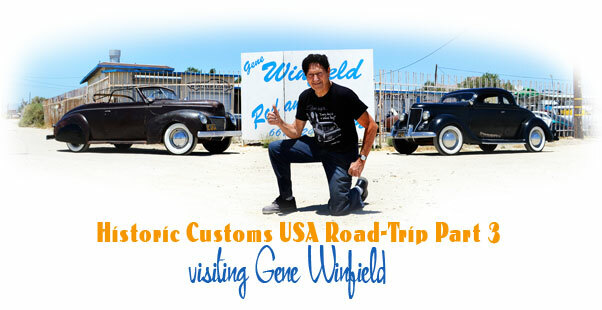 Micke and Ronnie talked to Gene about the trip, and how they had spend the last 11 days in Squeaks shop. Then told him the trip from Bakersfield had taken so long due to the heating problems. 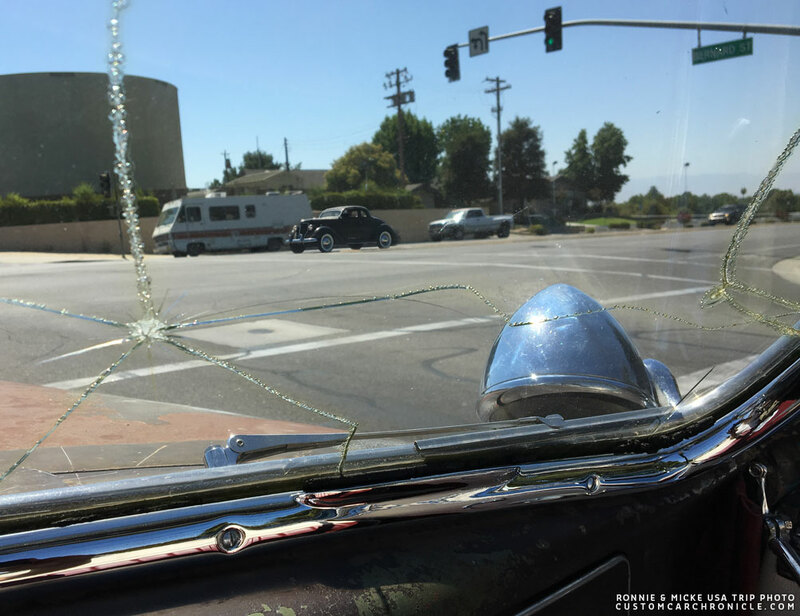 The guys hoped for a blown headgasket, they had already tried to get a pair at a local car supplies along the road, but most of the stores had sold their last flathead parts 50 years ago. 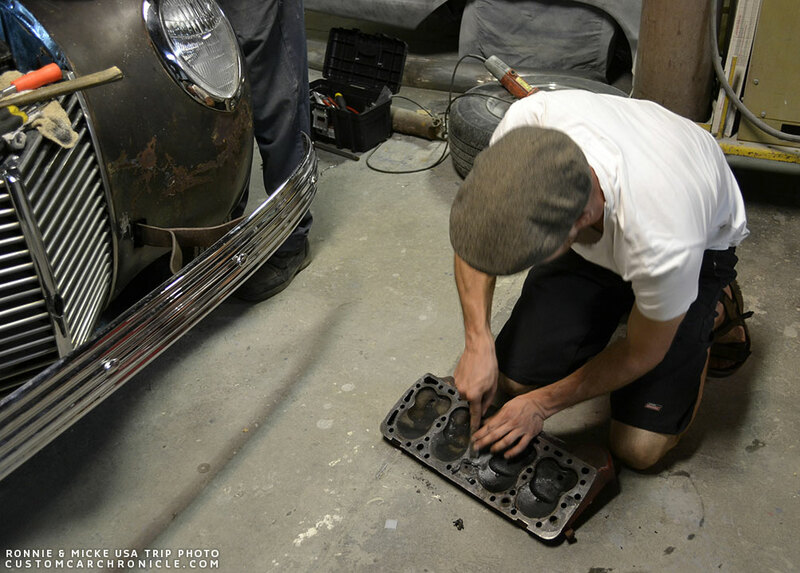 Gene told the guys that he might have a pair that was ment for a -49 merc project he had in the shop, Gene went into the shop and searched for the new pair of head-gaskets while Micke and Ronnie drained the water and prepared for pulling the heads off the engine. By now the un was set, and it was time to get to work on the Mercury, to see if the problems could be fixed. The guys and Gene working together on the Merc. What can be better than becoming friends this way? Its intresting how a big problem and frustrating work can result in such a great time. Micky cleaning one of the heads. 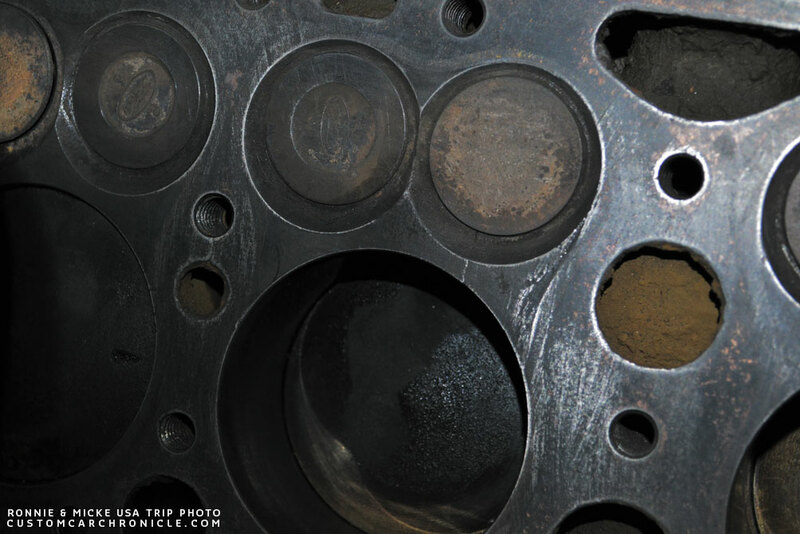 Sadly the old head gaskets looked good, but under the right head of Ronnie’s ’39 Merc engine the guys found the reason of overheating. Big cracks between cylinder and valves in two cylinders. They only had one spare engine, and that was already mounted in Micke’s ’36… there was no other choise than to put the heads back on and hope that the engine would make the trip till the end! And so they did… and then finally it was time to get some sleep. 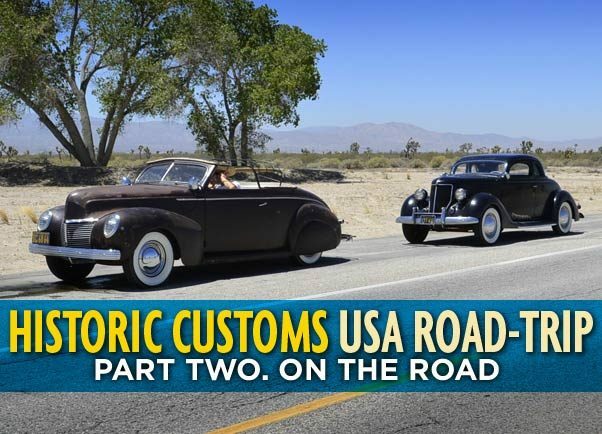 Go back to Part One or ahead to Part Three of the Historic Customs USA Road-Trip. 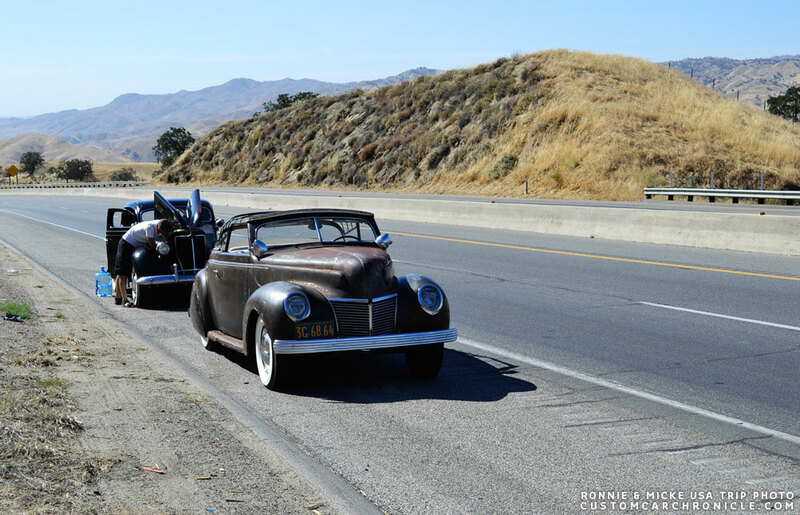 This is just jawdropping cool , old customs resurrected and back crusing the California road , Im aching for part three ! What an adventure! Bring on the next chapter!! Great stories and pictures. 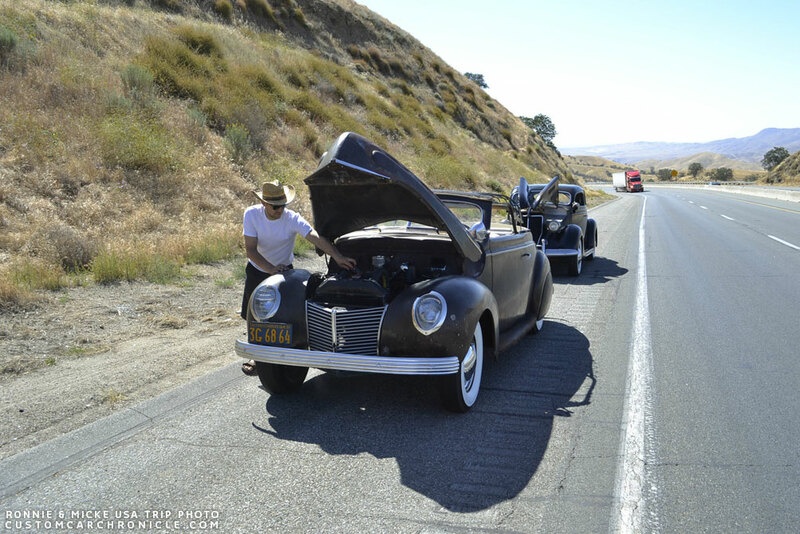 Talk about an adventure, those guys have some set of balls for that drive in the heat. 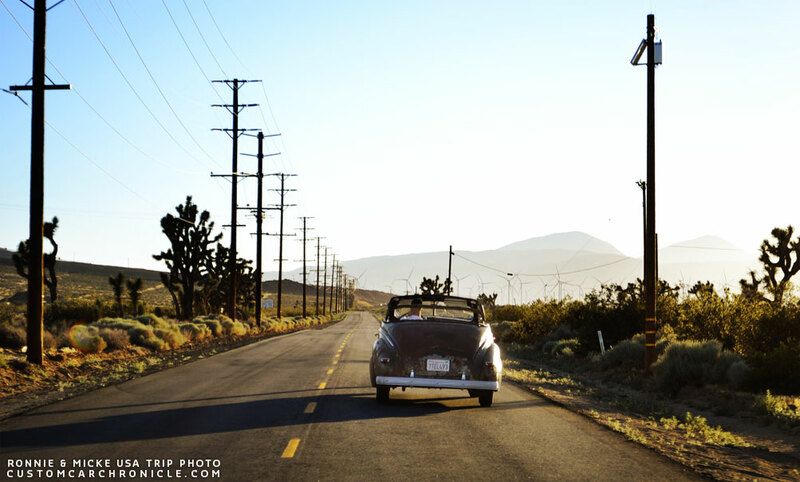 It’s one thing to have a custom car parked in the garage and quite another to go on a life adventure like this. Talk about living the dream. Laid my hands on a Carson-top frame….